Strange things in the news (part 8): does Siri believe in God? The internet continues to surprise me with the strange news items that get reported. 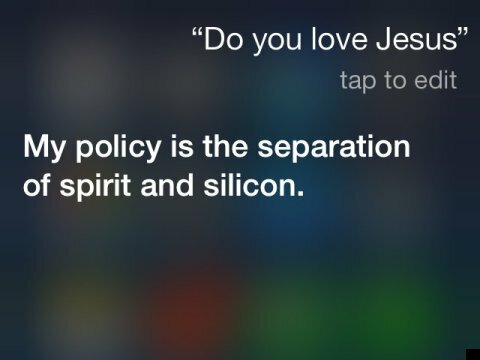 A religious reporter tried to interview Siri, the operating system on her iPhone, about Siri’s religious beliefs. Siri displayed an amazing ability to dodge questions, saying she didn’t engage in religious debate, suggested the interviewer ask a human about whether there was a God, and refusing to have an opinion on Pope Francis. When the interviewer asked whether Siri ate pork, Siri replied that she doesn’t eat much. When the interviewer asked whether Siri was good, Siri replied with a slight adaption of a joke by Woody Allen: she admitted to cheating in a metaphysics exam by looking into the soul of the boy sitting next to her. Full text here. The strangest things lead to murders. A man was stabbed to death in Dublin over a chess match. The murderer then ate his heart and apparently, his lung. This online test supplied by Time Magazine claims to predict your voting habits by factors such as whether you prefer dogs to cats and how tidy your desk is! when you look at the questions in the list, it’s lard to see how could be related to voting. Villagers in China built a wall of money out of $2.4 million in annual bones paid out on their village co-op. One man had to guard the money by sleeping on it, using a pillow made out of $875,000. He complained it wasn’t comfortable. So would you complain if you had to sleep on a pillow made out of a close to a million in cash? Can you figure out how the things in Time Magazines list are related to voting? Have you seen any other truly strange bits of news lately? Let me know!